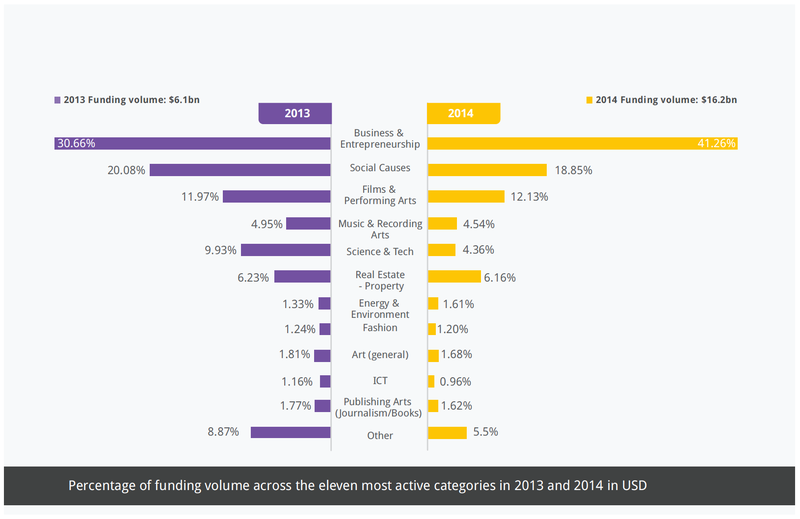 If crowdfunding’s been hot for awhile, last year, it was damn near on fire. In 2014, companies and individuals across the globe raised $16.2 billion through crowdfunding, according to a report released today by industry research firm Massolution. That’s a 167-percent increase from 2013, when $6.1 billion was raised. On the heels of a record year, crowdfunding is projected to lap itself again. This year, the industry is expected to generate $34.4 billion, according to the report. Looking at all of crowdfunding is like trying to figure out how to hug an octopus -- there are currently 1,250 active crowdfunding platforms, none of which is even close to holding a monopoly. Kickstarter, arguably the household “Kleenex brand” of crowdfunding platforms, has recently been usurped by personal campaign platform GoFundMe, according to the report. San Diego-based GoFundMe raised $470 million from 6 million donors in 2014, while Brooklyn, N.Y.-based Kickstarter raised $444 million last year from 3.3 million donors. Even while crowdfunding is an entrepreneur’s hustle, it’s attracting the attention of big corporate giants lately -- but for reasons that go beyond the money-raising aspect.